Global economic growth is making a stronger than expected comeback. It is likely to accelerate to as much as 4% in 2018 from 3.2% in 2016. This is good news on many fronts, but can we expect this stronger growth to relieve the frustrations about rising inequality and economic insecurity that have rocked the political establishments of many countries? That has been the implicit assumption behind the standard “growth model” of recent decades: a rising tide of GDP promoted particularly by supply side reforms and increased incentives for private capital investment and export-oriented production will ultimately lift all boats. But recent political developments around the world suggest that in many countries most citizens lack confidence in this. And ever since the financial crisis, political leaders have been voicing similar skepticism, calling repeatedly in G20 communiques and UN declarations for new and more deliberate efforts to make economic growth more socially inclusive. Despite this new consensus that broad socioeconomic progress should be prioritized much more strongly in economic policy, GDP growth statistics continue to be the primary way national economic performance is tracked by governments and reported in the media. Since what gets measured tends to get managed, the primacy of GDP statistics tends to reinforce the imbalance of attention and resources applied to macroeconomic and financial stability policies, which influence the overall level of economic activity, relative to the strength and equity of institutions and policy incentives in such structural policy areas as skills development, labour markets, competition, investor and corporate governance, social protection, infrastructure and basic services, which play an important role in shaping the pattern of economic activity and particularly the breadth of social participation in the process and benefits of growth. This is surely part of the reason the consensus on inclusive growth has yet to progress from collective aspiration to concerted action – into a change in the standard model that underpins the mindset of most economic policymakers and the priorities they set. 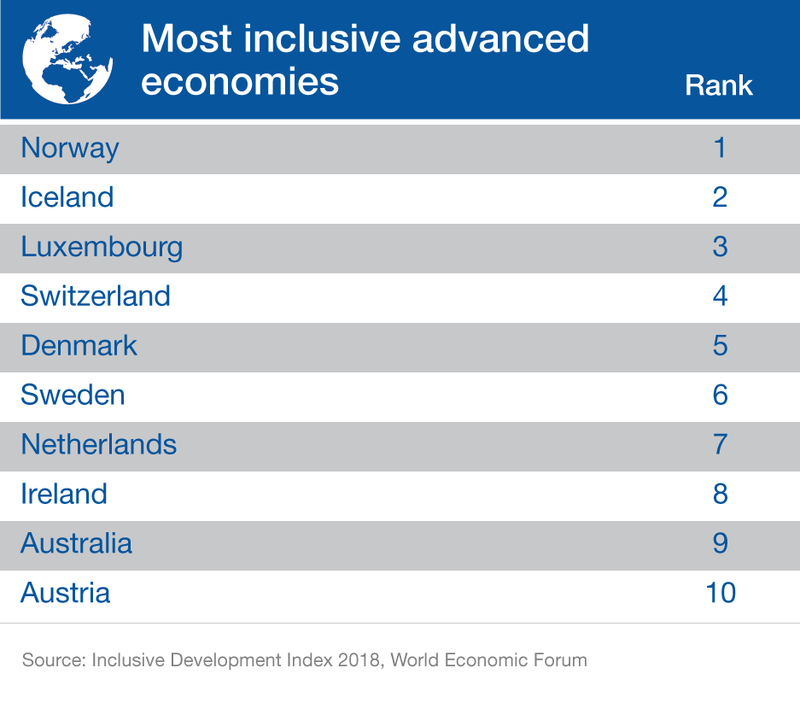 This week at the World Economic Forum’s Annual Meeting in Davos, the Forum’s Shaping the Future of Economic Progress Initiative is publishing such a broader measure of national economic performance, the Inclusive Development Index (IDI). The IDI is based on the notion that most citizens evaluate their countries' economic progress not by the amount of goods and services produced in their economy (GDP) but by their household's standard of living — a multidimensional phenomenon that encompasses income, employment opportunity, economic security and quality of life. GDP growth is best understood as a top-line measure of national economic performance— it is a means (albeit a crucially important one) to the bottom-line societal measure of success: broad-based progress in living standards. Accordingly, policymakers and citizens alike would benefit from having an alternative, or at least complementary, bottom-line metric that measures the level and rate of improvement in shared socioeconomic progress. The IDI provides this bottom-line report card for 103 countries. It is based on a wider dashboard of 12 indicators in three areas: growth and development; inclusion; and intergenerational equity and sustainability. The Index’s comparative data provide striking evidence that relatively strong GDP growth cannot in and of itself be relied upon to generate inclusive socioeconomic progress and a rising median standard of living. GDP per capita growth is rather weakly correlated with performance on three-quarters of IDI indicators, including those pertaining to employment, income inequality, wealth inequality, median household income, public indebtedness and carbon intensity. This finding is even clearer when IDI trends over the past five years are considered. All but three advanced countries have seen GDP expand over this period, but only 10 of 29 have registered clear progress on the IDI’s Inclusion pillar. A majority, 16 of 29, have seen Inclusion deteriorate, and the remaining three have remained stable. This pattern is repeated in the relationship between performance on GDP growth and the Index’s Intergenerational Equity and Sustainability pillar, and it holds even for the group of countries with the strongest growth performance. Developing country data show a similar disconnect between GDP growth and Inclusion. Of the 30 countries in the top two quintiles of GDP growth performance during the past five years, only 6 have scored similarly well on a majority of the Inclusion indicators, while 13 have been no better than mediocre and 11 have registered outright poor performances. GDP growth is a necessary but not sufficient condition for achievement of the broad-based progress in living standards on which citizens ultimately judge their countries’ economic success. This message is important to bear in mind at a time when global economic growth is finally rebounding to a more robust level. Political and business leaders should not expect higher growth to be a panacea for the social frustrations that have roiled the politics of many countries in recent years. Adopt a broader metric of national economic success that corresponds better to and incentivizes policymaker performance against society’s bottom-line measure of economic progress: broad and sustained improvement in living standards. The implicit income distribution system within many countries is in fact severely underperforming or relatively underdeveloped, but this is due to a lack of attention to and investment in key areas of policy rather than an iron law of capitalism. Inequality is largely an endogenous rather than exogenous challenge for policymakers and needs to be recognized, prioritized and measured as such in order to sustain public confidence in the capacity of technological progress and international economic integration to support rising living standards for all.